Provide comfort for the family of Jeaniece Neumann with a meaningful gesture of sympathy. Jeaniece Sandra Neumann, 61, of Phoenix, passed unexpectedly on March 17, 2019. She was surrounded by her loving family, as she joined her savior in heaven. Jeaniece was born to Everett and Ardelle Spittler in Anchorage, Alaska, on May 22, 1957. 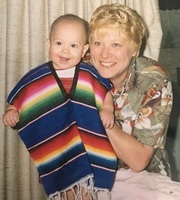 She is survived by her children, Crystal Lopez and Kelly (Cindy) Christensen; Sisters, Jennifer (Dave) Stacy, Kathy (Keith) Anderson and Sharon Seltenreich; Brothers, Tim Bitter and Richard Burrell; Grandchildren, Jose Lopez Jr., Jaden Christensen and Jordan Christensen. She is preceded in death by her father Everett Spittler, her mother Ardelle Burrell and her brother Ronnie Spittler. Jeaniece adored her three grandsons and bragged about them often. She also had a major soft spot for animals. Over the course of her life, she was the companion of more than 15 dogs. She saw these animals as children of her own and cared for them with all of her heart. If presented with the choice of spending time with her doggies or doing something else, she mostly chose the doggies. Jeaniece was known for having the “gift of gab” and could not keep a secret or conceal a surprise for very long. She was great at keeping in touch and never let distance tarnish connections with the ones she loved. Jeaniece had a kind, generous and loving soul. She lived a simple life and didn’t have much, but she was always willing to share what she did have. She was the type of person who, after meeting her just once, left an indelible impression as the most genuine, caring and compassionate woman. She enjoyed arts & crafts, scrapbooking, playing online games, spending time with her children & grandchildren, decorating her own fingernails and making beaded jewelry. She recently made more than a hundred pairs of beaded earrings and donated them to a local women’s shelter. Helping others and giving them joy, brought her great happiness and fulfillment. Please join us in celebrating Jeaniece’s life on Saturday, April 27th, 2019, at 12:00pm. Services will be held at The Church of Jesus Christ of Latter Day Saints, 8602 North 31st Avenue, Phoenix, Arizona 85051. Please wear purple, in honor of Jeaniece’s favorite color. Family and friends are invited to attend a luncheon at the same location, immediately following the service. In lieu of flowers, please send memorial donations to Crystal Lopez at 3955 W. Whispering Wind Drive, Glendale, Arizona 85310. We encourage you to share your most beloved memories of Jeaniece here, so that the family and other loved ones can always see it. You can upload cherished photographs, or share your favorite stories, and can even comment on those shared by others. Provide comfort for the family of Jeaniece Sandra Neumann by sending flowers. My mom was such a giver. She had one of the biggest hearts I’ve ever known. She genuinely wanted to help others, at every given opportunity. I know most mom’s are naturally proud of their children, but mom made sure she told Kelly & I how proud she was of us, just about every time we talked. She never missed an opportunity to let us know how much we meant to her and how proud she was, of the adults we have grown to be and the closeness that we share. Not being able to speak with her or receive her daily check-in texts, has been extremely difficult. Almost unbearable, some days. The realization that she’s physically gone, sometimes takes my breath away. But I know mom is pain free and thoroughly enjoying her time with grandma Ardelle, grandma Evelyn, grandpa Everett, all of her pups, and many others that she’s lost, over the years. Rest easy, momma 💜 Until we meet again. My cousin "Neicie" was an amazing soul! As a child, I idolized her, and as an adult, I adored her. As much as she loved her fur babies, her true heart's blessing was her children Kelly and Crystal. She was so proud of them and never missed an opportunity to tell of their accomplishments, their own families, and how much joy they brought her. The biggest smiles I ever saw from her were when we reminisced about their growing years and how fun it was to watch them transition into their own identities. I know that she is with her beloved family members that have passed, but she will always be watching over them and their children through the years. Sending kisses through the wind, her heart's song through the birds, her smiles through the butterflies, and her embrace through the sunshine. Today we are grieving for our loss, however her pain is gone and she has finally found the peace she so deserved. Rest well my beloved cousin. Until we meet again, Luv Ya Cuz!!! I am so sorry to hear about your Mom's passing. I am so sad. She was such a fun, full of life person. I will cherish the earrings she gave me. I am once again so sorry for your loss.